A virtuoso women's dance in 7/16 rhythm from the Shope region of western Bulgaria, this piece in the classic style of Bulgarian folk choreography. It opens with two songs in the antiphonal diaphonic style typical of the region: I na son Gjorgi upravna, and Junak Gjorgi konja kove (“Young Georgi shod his horse”). It opens with two regional songs typifying the flirtatious mood of the girls before a village gathering: Rano mi e more slûnce ogrejalo (“The sun rose early, but even earlier the dew had fallen from the young girls’ flowers...”), and Oj Stameno, Stameno (“Oh Stamena, colorful little bird/ Have you three maidens?/ Then give us one...”). 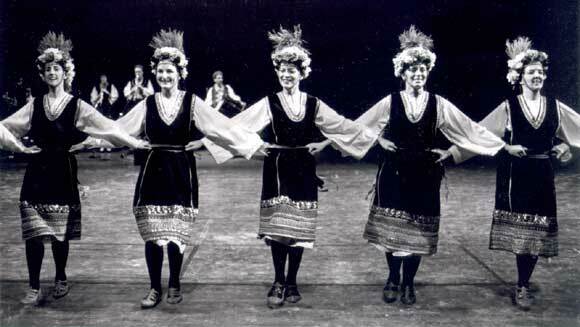 This choreography was performed at Radost's very first performance in May 1976 at the Slavic Department Sts. Cyril & Methodius day party at Seattle's Russian Community Center.